On June 24, 2015, the U.S. House of Representatives passed a resolution on Tibet, including a provision calling for increased “global public awareness and monitoring of the upcoming [exile Tibetan] electoral process”. This was the first time – to our knowledge – that any government body not only called for celebrating the young Tibetan democracy, but also for “monitoring”. This suggests the outside world is watching the upcoming exile Tibetan elections like never before. The question is: what will they see? So far, both Lukar Jam and Tashi Wangdu appear to be running clean, transparent Sikyong campaigns. The former political prisoner and the former businessperson have both come out with positive candidacies, with at least some degree of detail on their policies. Lukar Jam seeks Tibetan independence while Tashi Wangdu supports autonomy; we look forward to both candidates debating their positions, and we trust that they will continue to do so in a positive manner. The latest arrival to the Sikyong race, Tashi Topgyal, is so new that there is little to comment on so far. It is the two incumbents, Sikyong Lobsang Sangay and Speaker Penpa Tsering, whose campaigns have flirted with negativity and risk running afoul of the new rules the Election Commission (EC) has laid out. (We have serious concerns about the constitutionality of some of the EC’s rules, but this editorial takes the rules as given). None of the Sikyong and MP candidate is allowed to use any portrait of His Holiness the Dalai Lama and emblem of CTA on their campaigning literature. Using Tibetan national flag and Tibet map is also prohibited. If there is any evidence that any candidate violates the guideline, 5% of the votes received by the respective candidate shall be declared null and void. The Speaker’s and Sikyong’s official Facebook pages seem to qualify as “campaigning literature”, and certainly their election fliers do. When an incumbent is running for re-election, much of what he or she does is at least partly campaigning. It is difficult to separate campaigning communication from “official” communication. The dividing line may be unclear, but there can undoubtedly be campaigning even if an incumbent doesn’t actually say “vote for me”, especially when “official” actions involve promoting their image and policies. 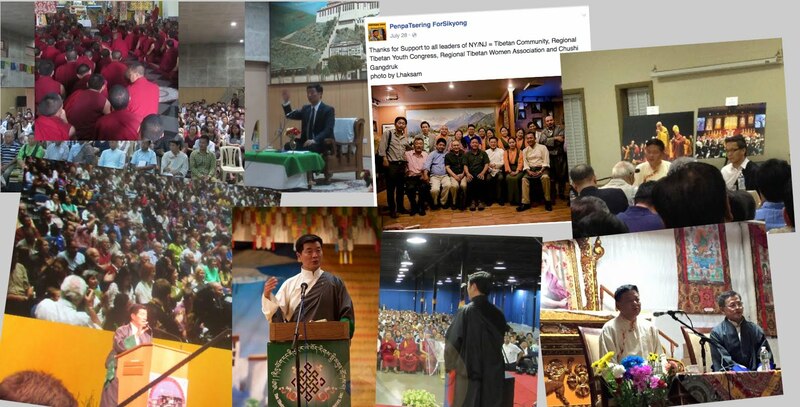 Similarly, Sikyong Sangay has an “unofficial” Facebook campaign page. There is a disclaimer on the page that it is “followed by his support” (whatever that means). During the prior election, Lobsang Sangay also used an “unofficial” campaign website, which allowed him to disclaim responsibility for its more contentious content. So absent a statement that Sikyong Sangay has no control whatsoever with the “unofficial” page, it would be reasonable to view the page as affiliated with his campaign. Based on the EC’s new rule, it would appear that the campaigns of Speaker Tsering and Sikyong Sangay may not have followed the rule against using His Holiness’s image, the Tibetan flag, or CTA emblem. According to the rule, any candidate who violates this prohibition will forfeit 5% of their final vote tally. Whether the EC follows its rule in this respect remains to be seen. The EC’s rules state that candidates “cannot seek services of any CTA officials nor can they use the finance and other materials of the CTA.” This rule is aimed at ensuring that incumbents do not misuse official resources and platforms for campaign purposes. This rule appears to have been violated in at least one instance already. Candidate Tashi Wangdu critiqued the performance of the Health Department under the Sangay administration. When running against an incumbent, it is to be expected that a candidate may criticize the incumbent’s current policies. The proper response is for the incumbent (as part of his or her campaign) to defend their policies. 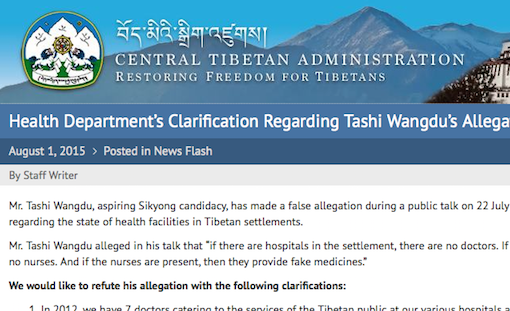 Instead, the official CTA website (Tibet.net) was used to post a statement attributed to the Health Department, dismissing Wangdu’s charges as a “false allegation”. This seemed to violate the EC’s rule. The question is whether this action was improperly directed at the Kashag level, or whether civil servants in the Health Department independently issued it and then civil servants in the Department of Information and International Relations (which runs Tibet.net) independently published it. If it is the former, then rather than using official resources and an official platform to respond to his electoral rival about a campaign issue, the Sikyong should have responded directly as a candidate. Unfortunately, rather than enforce its rule, the EC declared, “There is no way we would be able to investigate each and every case of this nature with the limited manpower we have. We are also not aware of the objective of the Health Department to issue this clarification.” What is the point of making rules that are not enforced? Hopefully this does not suggest selective enforcement by the EC. even while they [incumbents] are on official visits, they are not allowed to make any campaigning speeches; if any candidate is found doing such a thing in any place, the punishment shall be that votes received for the candidate in that place shall all be declared null and void. The EC should decide how it will differentiate between official speeches and campaign speeches (remembering that promoting an incumbent and his/her policies is campaigning, even if the incumbent doesn’t say “vote for me”). The EC must then apply this by looking at whether any activities of the Sikyong and the Speaker on CTA-funded travel were campaign activities. If so, then under the EC’s rules, the candidate’s votes received in that location are null and void. Or will the EC decide that it does not have the manpower to investigate this issue too? Speaker Tsering recently gave a campaign speech to Sera Monastery in Bylakuppe (hopefully his travel expenses were paid by his campaign, not the CTA). At this event, he reportedly declared that he would not debate any Sikyong candidate who criticizes His Holiness. This appears to be a thinly-veiled reference to pro-independence candidate Lukar Jam. The Speaker’s statement is problematic, even setting aside the inappropriateness of his attempt to drag His Holiness into the campaign, and setting aside that advocating independence is not “criticizing” His Holiness. The Speaker has the right to avoid debating with whomever he wishes, even if he thereby denies the public the chance to hear the candidates debate. But if the Speaker refuses to speak with a fellow Tibetan simply because they “criticize” His Holiness, will he also refuse to speak with the Chinese government that not only criticizes but also actually insults His Holiness? Some may view the Speaker’s statement as a misguided effort to appeal to the Sera monks’ religiosity. Others may suspect that Speaker Tsering is seeking an excuse to avoid having to debate Lukar Jam. Indeed, while the Speaker is an effective orator, his response to past criticism in Parliament has been to flee the floor and resign (and then un-resign), rather than face a contentious debate. Regardless of the reason, the Speaker has not cast his campaign in a favorable light. Our view is that debates should still be held, with or without the participation of the Speaker. Under the EC’s new rules, organizations have different free speech rights depending on whether they are officially “recognized”. A “recognized” organization can support any candidate it wishes, and its expenditures do not count toward a candidate’s Rs. 800,000 (US$12,500) expenditure cap. By contrast, “unrecognized” organizations may not campaign for a candidate without the candidate’s written permission, and any expenses count toward the candidate’s expenditures. 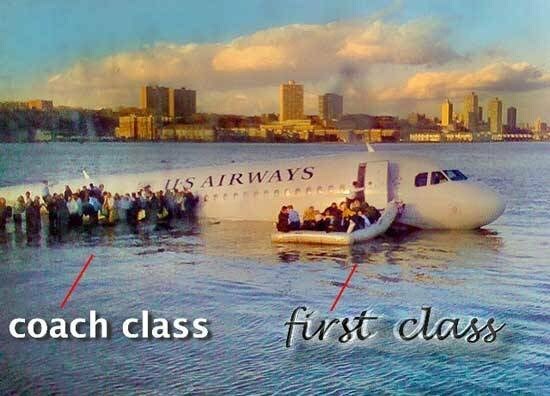 Apparently, “recognition” comes from the Kashag. In an illustrative hypothetical, imagine two groups in the United States want to endorse candidates so they approach President Obama’s Cabinet to seek “recognition.” If the conservative group does not gain recognition, it then needs to get Jeb Bush’s written permission to support him (so any misstep by the group could be imputed to Bush), and any money it spends counts toward Bush’s (hypothetical) strict spending limit. Bush would need to be very cautious relinquishing such control. By contrast, if the liberal group is recognized, Hillary Clinton can enjoy their support without being tied to them, and can theoretically have them spend millions of dollars completely separate from her (hypothetical) spending cap. It is a mystery why the EC made this rule conditioning free speech rights on “recognition.” All groups should be treated equally, and all should have free speech. Moreover, the CTA has no official process or criteria to “recognize” any organization. 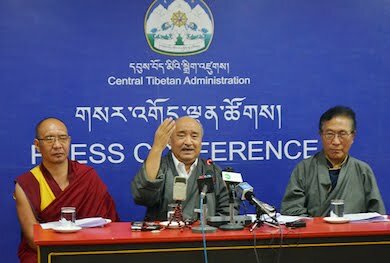 The currently-recognized groups were the ones to which CTA sent invitations during the First Special Meeting in 2008, during Samdhong Rinpoche’s tenure. The only group that CTA has officially recognized by issuing an official paper is Ngari Association, which happened during the time of late Juchen Thupten Namgyal. That means that NDPT, which is “recognized” and supports Lobsang Sangay and Penpa Tsering, has no limits on campaigning and it could spend unlimited amounts. The Tibetan National Congress (TNC), which is not recognized and supports Lukar Jam, can only campaign for him with his written permission, which ties him more closely to TNC, and also obligates him to include TNC expenditures toward his cap. TNC wrote to the EC about this unfair two-tier system. Unfortunately, the EC essentially washed its hands of the disparate impact of the rule that it created. The EC stated that it had no jurisdiction over recognition -- without addressing why the EC tied speech rights to “recognition” in the first place. The EC suggested (with no apparent irony) that TNC petition the Kashag for recognition. The EC may have overlooked that TNC is supporting a candidate challenging Sikyong Sangay, which hopefully will not impact the Kashag’s speedy recognition. Nor did the EC acknowledge that groups like TNC are in this position because the EC itself conditioned certain free speech rights on recognition from the Kashag (a condition never before imposed on Tibetan civil society). The last TPR editorial predicted that the Tibetan election would face several challenges. For campaign expenses, it asked “what is the permissible dividing line between official travel and a campaign visit? What about official media outlets being used to promote an incumbent and his election manifestos?” It discussed “the use of unaccountable surrogates.” It predicted that “if a pro-independence candidate emerges, we expect that he or she may be branded with absurd allegations about being ‘against’ His Holiness.” Regarding the EC, the editorial noted it “is not clear how the EC plans to enforce” its rules or deal with violations. None of these predictions were particularly novel, but unfortunately they have come true thanks to actions by Sikyong Sangay and Speaker Tsering, and inaction from the EC. Fortunately, Lukar Jam and Tashi Wangdu are showing a cleaner side of the Tibetan election. There is still time for Speaker Tsering and Sikyong Sangay to reform their campaigns to meet that standard, and for the EC to step up to fairly enforce the rules that it promulgated. 2. Translation by the Tibetan Center for Human Rights and Democracy (TCHRD), http://www.tibetanpoliticalreview.org/articles/ecrules--codeofconductfor2016exiletibetanelections. The EC recently clarified this rule that a candidate must be “found” (presumably by the EC) to have violated this rule before action will be taken. See http://tibet.net/2015/09/election-commission-explains-penalties-for-violation-of-electoral-regulations/. 3. https://www.facebook.com/pages/Sikyong-2016-DrLobsang-Sangay/273534819327898?ref=br_rs. The recent EC clarification also states that no one, other than officially recognized Tibetan NGOs, can endorse or campaign for a candidate without the candidate’s written approval, and campaign literature must specify the names of the people who printed and circulated this literature. Presumably this would also apply to social media and online campaign websites. 10. The new EC clarifications also state incumbents are not permitted to engage (in official capacity) in debates/discussions organized by NGOs. This is a very strange rule since most debates in the last election were organized by NGOs and it’s unclear whether the CTA will organize any debates for this election. Moreover, how does one distinguish between “official capacity” and “non-official capacity” debates? This rule seems almost designed as an excuse for the Sikyong and Speaker to avoid debates entirely, which would be very unfortunate for the Tibetan electorate.